Following part 1 at my blog this is not yet the part 2 I wanted to write about. It is just something in between I wanted to share. 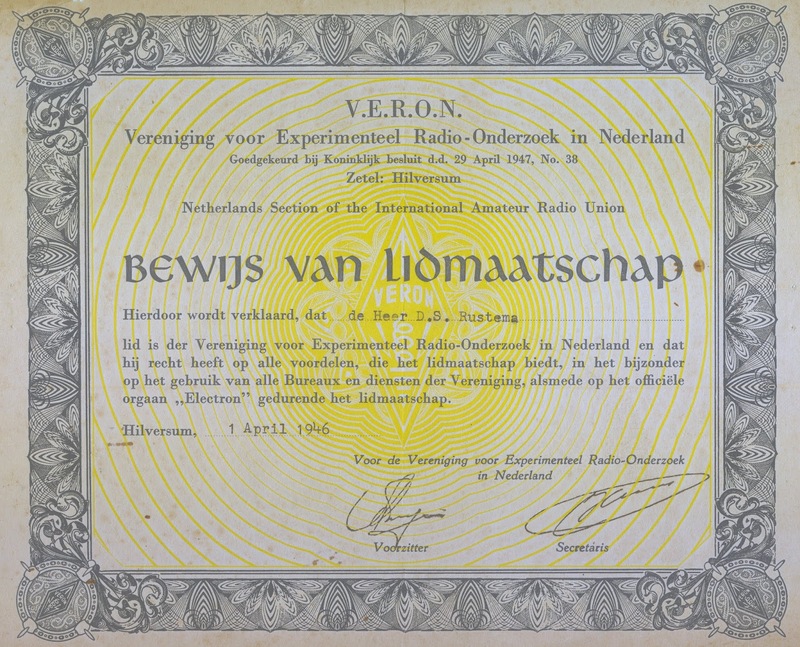 With the help of others and specially my neighbourstation PA3BCB Gerard who wrote me after I published the dutch PA0DR story in our local magazine Hunsotron and on my blog. He knew Dirk personally and saved some valuable memorabilia after Dirk died in 1991. Some of the items don't fit into part 2 of the stories but are interesting to show I think. Gerard sent me some scanned pictures from the items he has but after some e-mail exchanges decided to give almost the whole package to me for the story and to show others that are interested in the history of this dutch HAM. 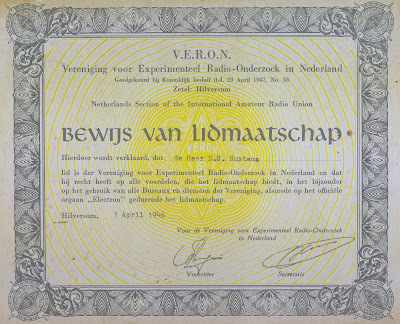 On top you see a first edition (1959) of Quad antennas by William Orr, Dirk was very interested in quad antennas and had one himself. 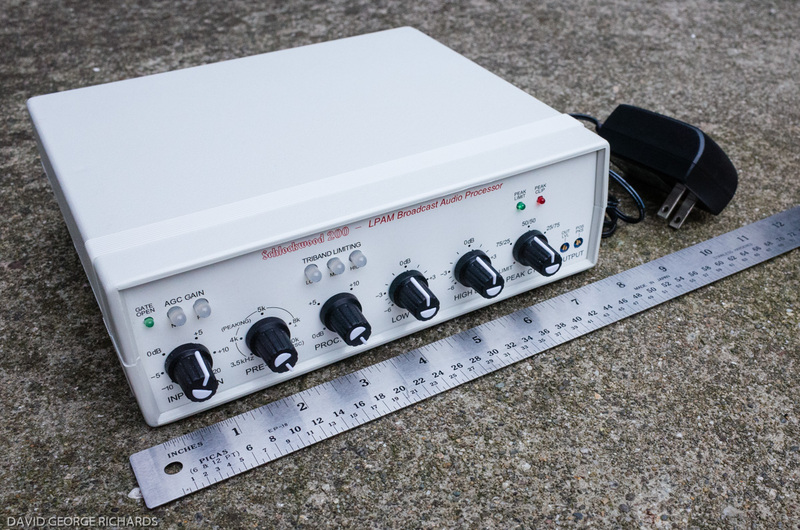 Just when I'm interested in a quad antenna to replace my HF5B. Is this a coïncidence? 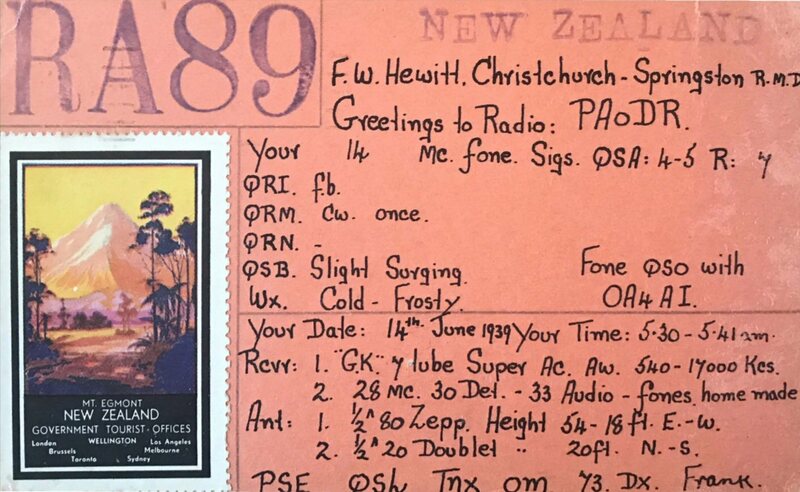 A QSL card by a SWL (RA89) from New Zealand was sent to Dirk in 1939 when he witnessed a first with Peru for PA0DR. 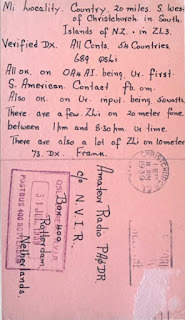 The card has very nice details from a short wave receive station at that time. You can click on the pictures to enlarge. 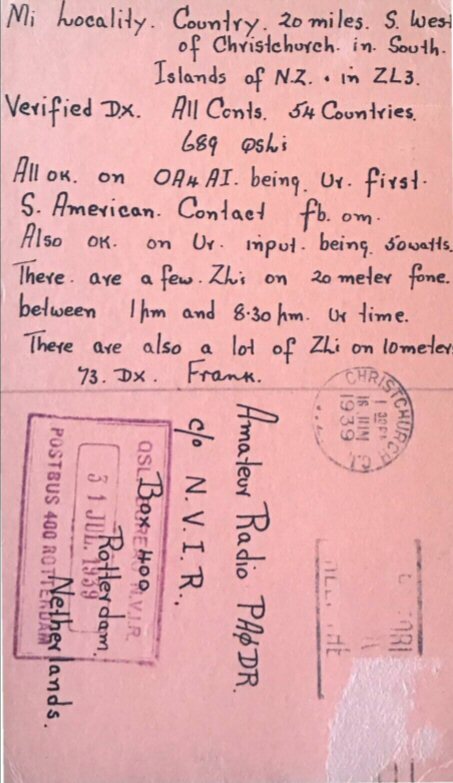 Notice the QSL came via dutch radio organisation NVIR (Nederlandsche Vereeniging voor Internationaal Radioamateurisme). After the war NVIR was one of the organisations that united with others to form the VERON which is still the largest radioamateur organisation in my country. Dirk became a member a year after the war. Wait, there is more to tell. 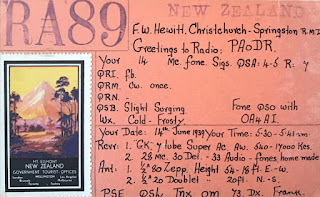 If you read my last months article well and followed the link to the picture from the possible "Winchester" transmitter you see a nice picture from a home made replica transmitter. It's the kind that could have been used by the resistance in WW2. I didn't notice that this article was written by PA3BCB's XYL. Gerard has this replica in posession and brought it with him to the radioclub evening to show us. I really don't know what kind of bulb is on there but this transmitter features some nice details like square wire to connect all individual parts. 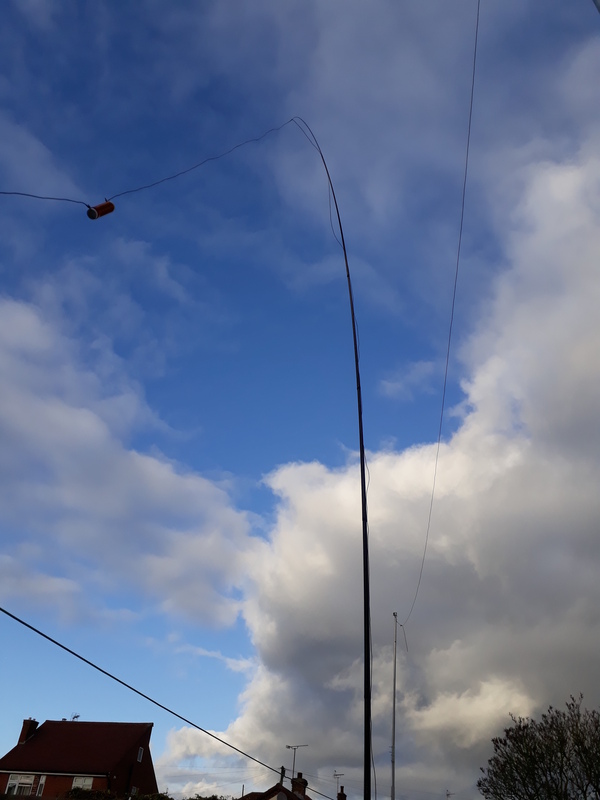 According to Gerard there are few components and/or wiring missing and to get it to work on the 80m band another coil is needed. The coil at the side of the bulb is for 14MHz I believe. There is a possebility that this replica has been made by Dirk PA0DR but so far we didn't find any evidence for that. It is Gerard's intention to restore the transmitter and make at least one CW QSO with England with it like the resistance did in WW2. Of course I'll keep you readers informed about this.